LACONIA, THE IDEAL DESTINATION FOR INCENTIVES, CONFERENCES, CONGRESSES, MEETINGS, BUSINESS TRAVEL, INTERNATIONAL CULTURAL AND SPORT EVENTS. Welcome to Laconia, home of legendary city-state of Sparta, of distinctive historical importance, an intermixture of beautiful landscapes and wild nature that impress every visitor. 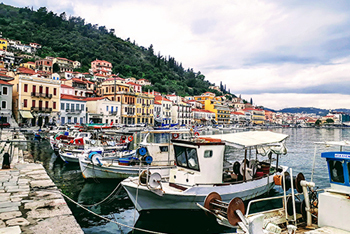 Steeped in history with archaeological sites, and ancient theatres, traditional and historic cities, churches and monasteries, awesome landscapes with forests, rivers, valleys, caves, gorges and wonderful beaches, Laconia is a must visit destination across Peloponnese. 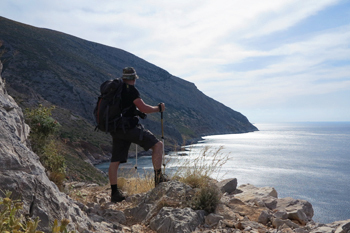 Visit the historic ancient city of Sparta and get a glimpse of glorious ancient Greek history, the ghost town of Mystas, Mani and the medieval town of Monemvasia, while getting to the astonishing beaches of the area and the small neighbouring island of Elafonissos. Traditional settlements and boutique hotels across the area offer high standard accommodation offering high quality services with marvellous views of the surrounding area. All kinds of tourism are well served in Laconia, offering a plethora of options to satisfy any visitor's tastes. Holidays of archaeological interest, religious tourism and ecotourism find their place among countless churches, ancient sites and unique caves at a background of scarce natural beauty. Where time has stopped, Laconia brings its magnificent past and hospitable present together in an impeccably unique way. Laconia can be accessed by road and sea, as the nearest airport is the one of Kalamata at the prefecture of Messinia. Regular bus services connect its capital city Sparta with Athens, Thessaloniki as well as major cities of Peloponnese. However the most convenient way to explore the area is by renting a car in order to reach the remote and picturesque villages and discover at one's own pace the magic natural beauties of its mountains and coast. By sea the area can be reached from the port of Piraeus to Monemvasia with a few routs within the week, of by private sailing boats. Finally the port of Neapolis connects the mainland of Peloponnese with the islands of Elafonissos and Kithira. Amongst the most popular destinations of Laconia is the medieval town of Monemvasia situated on a sole rock at the south east part of Peloponnese, the best maintained castle city in Greece, still inhabited. While the only entrance to the rock place is though a bridge with twelve arches, visitors can initially admire the city walls' reaching down the sea, until realizing after entering that time has actually stopped in this magical almost unreal town. The architecture has remained untouched as no single modern building can be found within Monemvasia, which is full of narrow stone-paved streets, castles, old mansions, old low arches, coats of arms, byzantine icons and several old churches is where the middle age meets Byzantium. Heading uphill to the top of the rock, one can find the castle to offer fascinating view of the Aegean Sea, while several beaches across the area are just perfect for a refreshing swim. 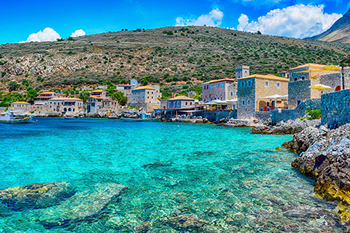 The western coast of Laconia hosts the town of Mani, with a distinctive identity to separate the locals with the rest of the Greeks, having a harsh yet beautiful land, dotted with fascinating stone towers and architecture. A visit to Areopolis with stone-paved narrow streets and all the way down to the deserted settlement of Vathia characterized by medieval skyscrapers, fortified towers and over a thousand year old churches built against the bluest of seas must be part of your itinerary. Right cross the port of Neapolis is the small in size island yet with one of the largest sandy beaches in Greece, Elafonissos, ideal for relaxing holidays. 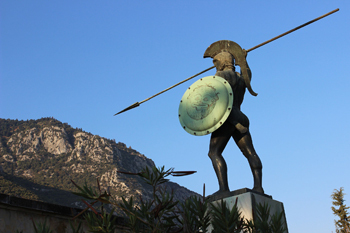 Sparta was a powerful city-state in ancient Greece, dominating the area during the 6th to 4th centuries B.C. and a long term enemy of Athens. As the defence of the city was based on the legendary courage and the intensive training of its warriors, rather than the fortification system, along with the limited cultural activity of the Spartans, the old city nowadays has a little to offer compared to its historical importance. The excavations in the area revealed the saved relics to delimit the sanctuary of Athina, at the top of the Citadel, an ancient theatre surrounded by shops, an orchestra with votives of the Spartan leaders during the Roman years, a temple, a circular building and remains of a big basilica since the medium Byzantine years. The findings of the local excavations are exhibited at the archaeological museum of Sparta, featuring important exhibits from the sacred temples of Chalkiikou Athena and Orthia Artemida, as well as ancient Spartan frescoes. Just 6 kilometers from Sparta is ancient Byzantine site of Mystras, lying among wonderful landscapes, definitely worth a visit. This enchanting trip starts on the visitor's way to the site while driving through the breathtaking gorges of the Langhada Pass, and impressive Taygetos Mountain Range, to finally reach the Franc Fortress Gate to the upper city. 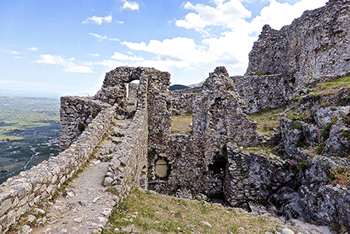 Being concurred by the Byzantines where actually Konstantinos Palaiologos was crowned, the Venetians and the Turks, Mystras was one of the first regions of Greece to be freed form the Turkish occupation. The ancient city spreads across and upper, mid and lower parts, with a castle, domes and palaces to give one's the feeling of stepping back in time, while stumbling across the stunning byzantine religious art within the abandoned churches. 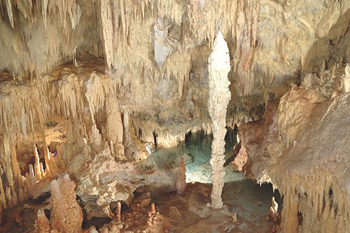 The Caves of Dirou is a must visit natural attraction, being among the best of its kind around Greece. Consisting of two main caves, Glyfada and Alepotrypa carved out of the limestone by the slow-moving underground river Vlychada heading to the sea, the area was a place of worship as entrance to the underworld since the Paleolithic and Neolithic times, while being used as a shelter, dwelling, workshop, storage place and cemetery as well as a hiding place for Resistance fighters during World War II. The journey through the caves start with a 25 minute boat tour of Glyfada's grottoes, with luminous formations, some of the best in Europe, of colorful stalagmites and stalactites resembling buildings and mythical beasts. Although the cave system is believed to be over 70km long having more that 2.800 waterways, to reach as far as Sparta, only 1km is explored during this magnificent boat trip. The tour ends with a short walk in order to enter a passageway above the crashing surf with close quarters, to make this visit entertaining though surreal experience. The Laconian landscapes with dense vegetation and a diverse morphology, with caves, gorges and endless pine forests, chestnut and pine trees with harmonic co-existence of sea and mountains, create a unique background for nature lovers and explorers. Outdoor enthusiasts have a variety of activities to choose from; mountain climbing, cycling, hiking, diving and windsurfing. 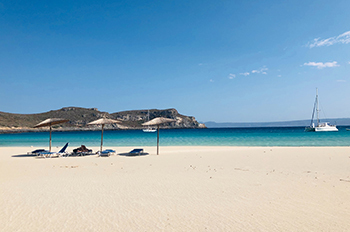 The countless lovely sandy beaches that surround the prefecture are ideal for relaxation, sailing and yachting holidays, while Neo Oetylo, Archangelos, Kakkala and Yerolimenas are some of the most beautiful beaches of the area. 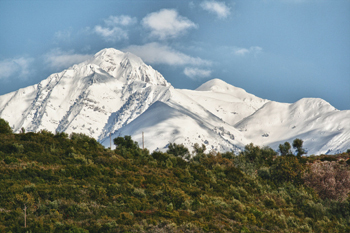 Follow the wine roads of the area to find some of the finest varieties around Greece, or pursue a visit to Geraki to get a glimpse of the centuries back weaving rugs tradition. 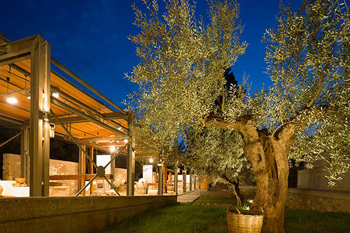 Mystas is widely known for its organic cultivation and cattle-raising, reflecting on the quality of the local products. Excellent olive oil, thyme honey, figs, unique dairy products such as the top quality feta cheese and graviera, garlic, prickly pears, fresh fish and thyme are only some of the natural products grown to perfection in the microclimate of the slopes of Taygetos Mountains. 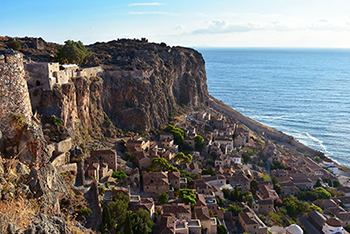 Monemvasia, although being touristic offers an abundance of good food, including premium citrus fruit and olive oil. Once being here, the local herb pies, the traditional almond sweets, as well as Skaltsounia, Floyeres, Samousas, Meletinia or the local almond jam, all well worth a try. The areas of Monemvasia and Krokees are also known for winemaking, some of which being organic, offering a perfect accompaniment to local dishes.